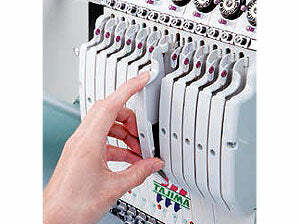 TMAR-K904C-500 has 9 needles, 4 heads, cylinder style, controlled presser foot, improved tension, touch screen, error lamp. 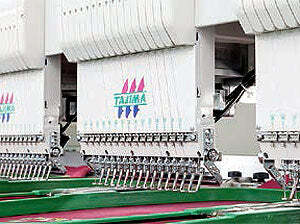 Tajima TMAR-K904C-500 9-Needle 4-Head Cylinder Embroidery Machine. The TMAR-KC series is the embodiment of TAJIMA's technologies with high production effi ciency, ultimate quality, outstanding durability and performance. 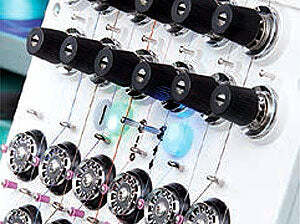 A newly developed digitally-controlled presser foot can adjust its bottom dead center and stroke for each needle bar (color change). As a result, the fabric does not flip-flop and thread breakage at the start of stitching decreases dramatically. From thin fabric to thick fabric, such as tulle, cotton, silk, leather and quilting, this presser foot makes it possible to do high-precision embroidery. In addition, since needle wobbling at the time of needle insertion has been reduced by 60%, detailed embroidery can be finished beautifully. 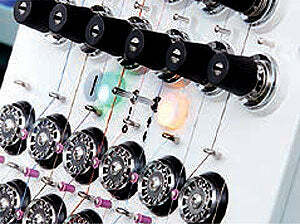 For preserving stable quality, it is important to adjust the thread tension according to thread, fabric and design. The newly designed middle thread guide has halved the thread tension setting time for one needle compared to Tajima's conventional middle thread guide. You can set thread tension easily. Since the tension and stroke of the thread take-up spring can now be adjusted for each needle bar and the adjustment can be made according to thread type and stitching method, the variety of thread from thin thread to thick has expanded dramatically. 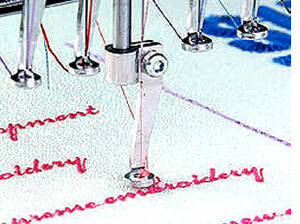 When the easily-attachable/detachable thick thread part set is used, thick thread embroidery can be done easily. The machine head has the new crank drive, increasing durability. Maintenance is simple and the lubricating frequency has been reduced by a factor of 20 to once in 6 months. 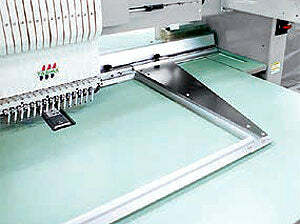 When the operation is stopped during appliqué embroidery,for example, and the frame is moved manually, the offsetlamp on the tension base lights up in blue. (Must be preset on the operation panel).If an abnormality is detected on any head, the maintenancelamp of the problem head lights up in yellow. 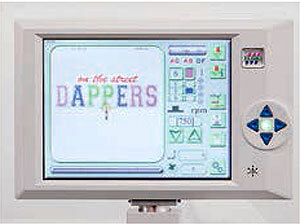 This display is equipped with an intuitive, easy-to-use operation panel with easily identifiable icons, and a high-capacity memory that can store up to 40 million stitches or 650 designs. Since the frame drive system was reviewed and the rigidity of the Border Frame was reinforced, high-quality embroidery can be realized even in high-speed operation. Even in fine, dense embroidery, shrinkage has been minimized. 320w (570VA) - 580w (910VA). Machines are available with regular 360mm head spacing or wide field 500mm head spacing. Information about this model has a highlighted background.